It's been snowing in Oslo more or less continuously since the early hours of Monday, and it's now late Wednesday evening. 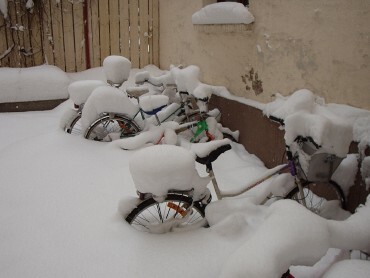 We had a lot of snow here from before, so the result is a snow record: the last time we had this much snow in Oslo was 1968. Altogether it's about two feet. The result has been that car traffic has been all clogged up on the main roads in and out of Oslo, but public transport has been less affected, especially the tram and subway. Not that walking has been that simple, either. I took some pictures on the way to work this morning, just for fun. The snow starts in the back yard, as you can see below. 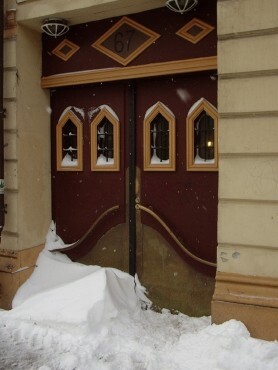 The streets have been plowed multiple times, but when the snow just keeps falling they can't be cleared completely. So you have to wade in the snow like you see below. 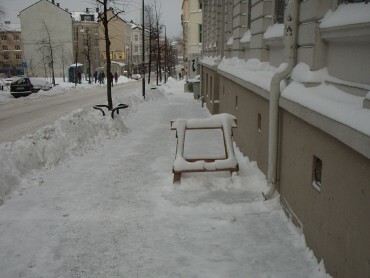 Another fun thing is the obstacles that get placed along the sidewalk, like in the picture below. They may look mysterious or even pointless, but are actually very important, since they warn about roofslides and falling icicles. 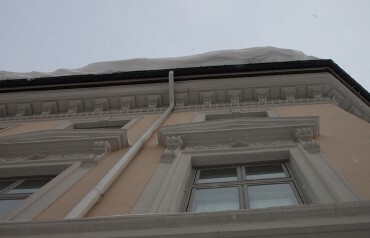 There was an interview with the person on the city council responsible for the clearing of snow, and his take on the situation was that "this is life at 60 degrees north". It's hard to disagree with that, really. Anyway, the skiing is great. It looks GREAT!!! SO BEAUTIFUL!!!!! 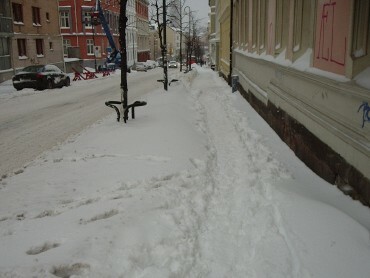 I wanna have a winter like this one, even if just once! In New York (where I lived through 15 winters) the snow would get so dirty in no time at all, and it was sloshy and humid... cold feet! !